Cleveland Uncommon Sound Project is a new non-profit devoted to the creation and performance of new music. Their first annual Re:Sound New Music Festival opened on Thursday evening, June 7 at the Bop Stop, where a large, diverse crowd sat around tables and the bar to hear four equally diverse and alluring ensembles. 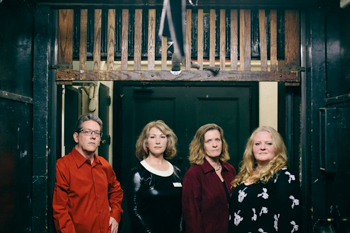 The St. Paul-based Zeitgeist –– clarinetist Pat O’Keefe, percussionists Heather Barringer and Patti Cudd, and pianist Nicola Melvill, pictured above — performed Cambodian-born composer Chinary Ung’s Play Spiral XIV “Nimitz” (2016), a work whose tonal structure and melody are influenced by traditional East Asian music. Piano and clarinet were center stage, with a percussionist on either one of them playing a vibraphone and various accessory instruments, the other covering a large marimba, drums, and cymbals. The composer weaves a complex antiphonal texture, replete with improvisatory melodies spun out by the clarinets (E-flat, B-flat, and bass), and syllabic vocalizations from the percussionists and pianist. At the end, the combination of tuned percussion, piano, and whistling created a haunting effect. 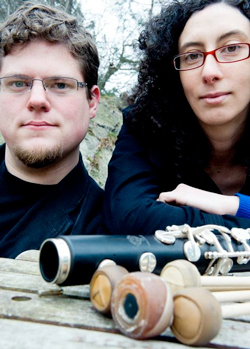 Boston-based Transient Canvas — bass clarinetist Amy Advocat and marimbist Matt Sharrock — performed two works that incorporate electronics into the soundscape. Kirsten Volness’s Year Without a Summer (2017) begins with murky, low sounds. Tonal, minimalist phrases emerge from the marimba, and later the electronics’ mysterious bass tones become more pointed and bell-like, with the clarinet providing the harmonic underpinning. The phrases and harmonies were developed in an arc, with a return to the opening music at the end. Dan VanHassel’s Epidermis (2017) was a tour de force for the performers. Advocat handled the motoric rhythms, high-register “squeals,” multiphonics, and other extended techniques, while Sharrock played an unending stream of increasingly complex rhythmic patterns on all surfaces of the marimba. The electronics were more closely integrated into the texture than in the Volness, and at times the sounds resembled electronic dance music surrounded by white noise. Though the performers looked exhausted at the end, the audience was energized. 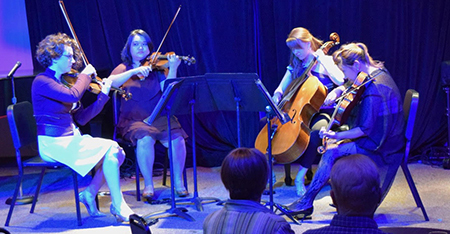 The Boston-based Semiosis Quartet –– violinists Nicole Parks and Kyra Davies, violist Lauren Nelson, and cellist Allison Drenkow –– chose to play Shi-Hui Chen’s Fantasia on a Theme of Plum Blossoms (2007). It was the oldest work on the program and the most traditional in its instrumentation. The three-movement quartet melded East Asian influences with Western European tradition. The musical style is austere and spikily dissonant, with development of themes spread around the quartet. Although the slow third movement, titled “Plum Blossom,” was the shortest, it was the most interesting, with its mournful melody in violin and cello, and the viola playing in the plucked, melodically drooping style of the pipa (the Chinese lute). The sustained and serene music was heterophonic: musical lines were performed simultaneously among the instruments, but not in unison, creating an echoing texture. 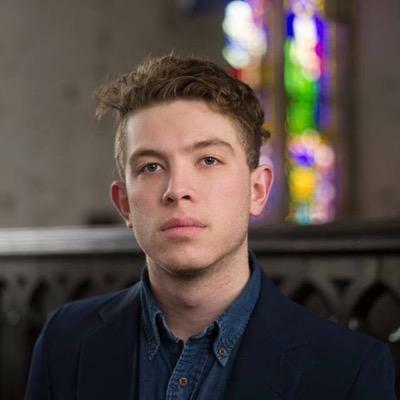 The last set was devoted to four works by Cleveland-based composer Buck McDaniel, who played piano and controlled the electronics, assisted by soprano Kristine Caswelch, vocalists Kyle Kidd and Dylan Glover, and cellist Sophie Benn. In Marefka Sketches (2018) for solo piano, quiet, unison octave passages alternate with suddenly loud, violent chords. The octaves form a kind of refrain, creating stark contrast with the other phrases. The piece, which bears a similarity to some of Philip Glass’s piano solo etudes, ended in an unexpected, loud chord. plainsong (2014, rev. 2017) was, in the composer’s words, “early church music combined with Nina Simone,” and featured arresting vocalist Kyle Kidd. Her voice was equally at ease with sultry cabaret, belting vocals, and high, operatic soprano. The work combined aspects of gospel and blues, as well as electronics. The piano and the cello produced a kind of jazz continuo, which evolved into an extended duet. Each verse began with “I wish…,” the music moving ever higher, thicker in texture and more brilliant. The effect was one of power and passion. This Is What You Shall Do (2014, rev. 2018) again featured cello and piano, this time with soprano Kristine Caswelch singing text from the preface of Walt Whitman’s Leaves of Grass. The music sat very high the soprano, creating some intonation problems and unintelligible words. The closing work, Conditions of Living (2012, rev. 2017), brought the entire McDaniel and Friends ensemble together for a setting of a poem by Ben Jonson, the English Jacobean poet. The music was continuously layered upon itself, engulfing the live performers in an enormous collage of electronic sound. The contrast between classical and pop voices was intriguing as the work reached higher and higher. It ended with a gloriously shimmering and magical texture. Semiosis Quartet photo by Sophie Benn.